SaskPower crews inspecting and repairing power poles. 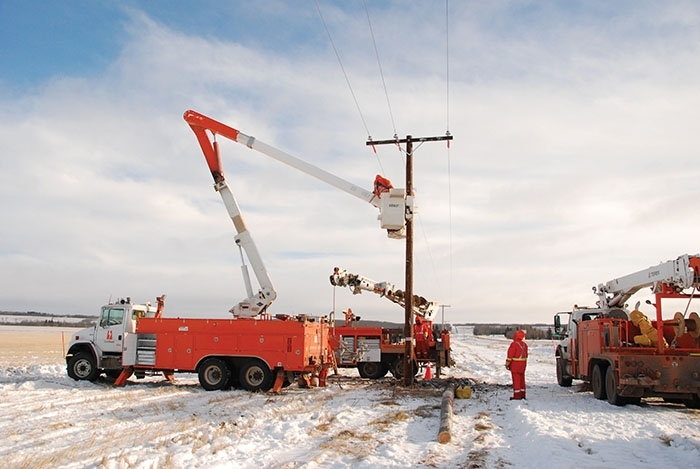 When the power went out for about 10,000 people in Southeast Saskatchewan the night of Feb. 27, and stayed out for almost 24 hours in some areas, the lengthy power outage left many people wondering what was going on and why it took so long for power to be restored. A few weeks before that, a power outage in Moosomin killed power for about an hour over the lunch hour and left local restaurants in the dark, unable to feed their customers. Jonathan Tremblay, a spokesperson for SaskPower, says that since the middle of December there have been seven outages in the Moosomin area, which is above normal. However he says SaskPower is making efforts to stabilize power in the Southeast in the long-run, so that outages should become less common in coming years. “In general, a third of all power outages are weather related, a third are caused by aging infrastructure and a third is wildlife,” said Tremblay in an interview with the World-Spectator. “For the Southeast we see a lot of weather and we of course see a lot of aging infrastructure. “We have 1.2 million poles in the province, and a lot of those were planted in the ‘50s, ‘60s, and ‘70s. So there is a lot of work there, and that’s where we are spending about a billion dollars a year replacing them. But we are also building the power grid, because demand keeps breaking records every year. People are using more power home by home. Also our population and economy are still growing, so we are seeing that increase in demand, including in the Southeast. Tremblay says the two longer outages—the 24-hour one that hit communities along Highway 48 and to the south of them, and the hour-long outage over the lunch hour in Moosomin—were caused by unique circumstances. The 24-hour outage was caused by a transmission tower fire, and the hour-long outage was caused by ice buildup, which has also caused some smaller outages in the area. “A lot of people got power here and there throughout the day, but it was intermittent and certainly inconvenient,” he says of the 24-hour outage. “That was due to a malfunction from what we understand. We know that one of our larger (transmission) towers caught fire. To address that it took us the whole day. So we tried to re-route power as much as possible from our coal plants in the southeast, but also importing from Manitoba Hydro. That wasn’t the most stable, especially because we are talking about a huge line. “There were a few other outages that were mostly related to ice build up in January and February. That happens when we have those huge swings in temperature and we hover around zero degrees. Maybe it’s two to three degrees and everything is melting during the day, and then we plummet to minus-20 degrees, so we have that heavy ice accumulation on the lines in our substations. And that’s what we saw in your area. The Moosomin substation serves the entire area 100 kms around it. Tremblay adds that the other reason rural power outages can sometimes take longer to address is because it’s tougher to find the source of the outage—something he hopes technology will take care of in the future. “The misconception is that we know as soon as there is an outage and people may be bothering us by calling in an outage,” he says. “It’s the opposite. We need people to call in and tell us that their power is out because we don’t know until they tell us. “That is simply how power distribution and outages have been managed for 90 years and why we are trying to modernize the grid. This is notably through smart meters that we’ll introduce progressively over the next five, six or seven years. We would love to have that network where a power meter speaks back to us, and therefore if there is an outage we can pinpoint it very quickly. “But right now what we are stuck with is a system where people need to call us to tell us where the outage is. In a city setting, perhaps you and 15 other neighbors will tell us, so we will sort of know how many blocks we need to inspect to find a tree on the line or the shorted out piece due to wildlife. Tremblay says SaskPower is concerned when power is out for long periods of time in rural areas. “It’s certainly a consideration. Ultimately we would love for there to be no outages and no inconvenience for anyone. We work very hard to control what we can,” he says. “But a third of outages is aging infrastructure and then there is weather and wildlife. We do as much as we can to protect against weather and wildlife, but there are simply some things we cannot do much about. Tremblay says replacing power poles is one of the biggest projects that SaskPower currently has on the go across Saskatchewan in order to alleviate problems in the future. The other is building new transmission lines, including in Southeast Saskatchewan. “We have some pretty notable projects right now,” he says. “In Moosomin itself the large dollar projects are wood pole replacements for those old poles. Also there is some reinforcement and building of new transmission lines between Saskatchewan and Manitoba, which would allow us to better re-route the power around an outage and also better import power from our friends at Manitoba Hydro. There are also new developments in the southeast in your area for oil and gas and so on, and we are building new lines to serve economic growth there. “We have about 50 or more major transmission projects at any one time, and certainly there are a few in your area, especially that Manitoba border. As we look to reduce our emissions by 40 per cent by 2030, we need to consider how imports from Manitoba Hydro will play into that. Your area is exactly where we need to do that. How long will it take to get a smart grid with smart meters in place? Tremblay says they aren’t sure yet due to pending safety standards for the residential meters. “What we are doing right now is focusing on commercial and industrial models of smart meters,” he says. “There are millions installed of that exact model everywhere in North America. So those have been proven, they fit our safety criteria. We have tested them in-house for safety, now we are testing them for software and for how well they work in the field with our commercial customers.